New York Super Lawyers list in 2010-18. Super Lawyers recognizes the top lawyers in New York Metro via a patented multi phase selection process involving peer nomination, independent research and peer evaluation. That is an honor limited to no more than five percent of the Attorneys in the entire State. 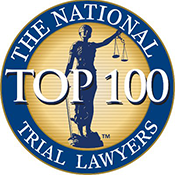 The National Trial Lawyers, Civil Plaintiff-Top 100 Trial Lawyers 2016-18. Membership in The National Trial Lawyers is limited to the Top 100 civil plaintiff lawyers in each state or from highly-populated regions of states. Members nominate their peers for membership. Prospective members are carefully screened before being invited to join. The criteria for membership include: Reputation among peers, the judiciary and the public. Achievements, settlements and verdicts as a trial lawyer. Nominations from leading trial lawyers, current members and Executive Committee members. Rankings and ratings by leading national evaluation organizations. 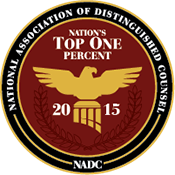 National Association of Distinguished Counsel, Nation’s Top One Percent 2015-18. VerdictSearch, “Top Verdicts” in 2010-18. 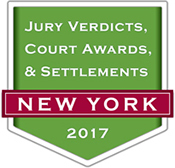 Recognizes U.S. law firms and attorneys who have obtained one of the highest jury verdicts, settlements, court or arbitration awards in the Nation or an individual State, in a particular area of law, and year. We have received this honor in the categories of premises liability, motor vehicle accident, medical malpractice, and contracts. New York Law Journal, “Verdicts and Settlements Hall of Fame: Medical Malpractice” in 2014 for the verdict of $3,500,000 in Stothart v. Montefiore Medical Center: Negligent Treatment category. New York Law Journal, “Top Settlements” for Premises Liability: Negligent Repair category in 2014 and 2016. Martindale Hubbell LexisNexis, received the “Client Distinction Award” in 2012, 2015 and 2018. Martindale Hubbell Client Champion Gold (2018). An exclusive recognition that demonstrates an attorney’s commitment to client service based on the quantity and quality of their scores on Martindale-Hubbell client reviews. Fewer than 1% of all attorneys have qualified to receive the award. Awarded to lawyers/firms with at least 6 reviews, with an average score of 4.2 or higher. Avvo rated “Superb Attorney” (10 out of 10). The Avvo Rating evaluates a lawyer’s background based on the information available in an attorney’s Avvo profile. The rating is created using a model that considers information the lawyer has included on their profile in addition to the information collected from state bar associations and other organizations that license legal professionals. Avvo considers and weights the information collected and provides a numerical rating, ranging from 1 to 10. Avvo takes into account an attorney’s qualifications, including experience, professional achievements, and disciplinary sanctions. Attorney Peter DeFilippis has a perfect rating of 10 “Superb” by Avvo.com, which is the highest rating Avvo assigns to a lawyer. America’s Most Honored Professionals, “Top 10%”. Pays tribute to business people who when ranked across professions and industries rise to the top of America’s most highly recognized professionals. Honorees were carefully selected from American Registry’s comprehensive database of publicly acknowledged professionals. Qualification criteria include repeated, authenticated, publicized honors from the press, peers, trade groups and clients over a five year period. 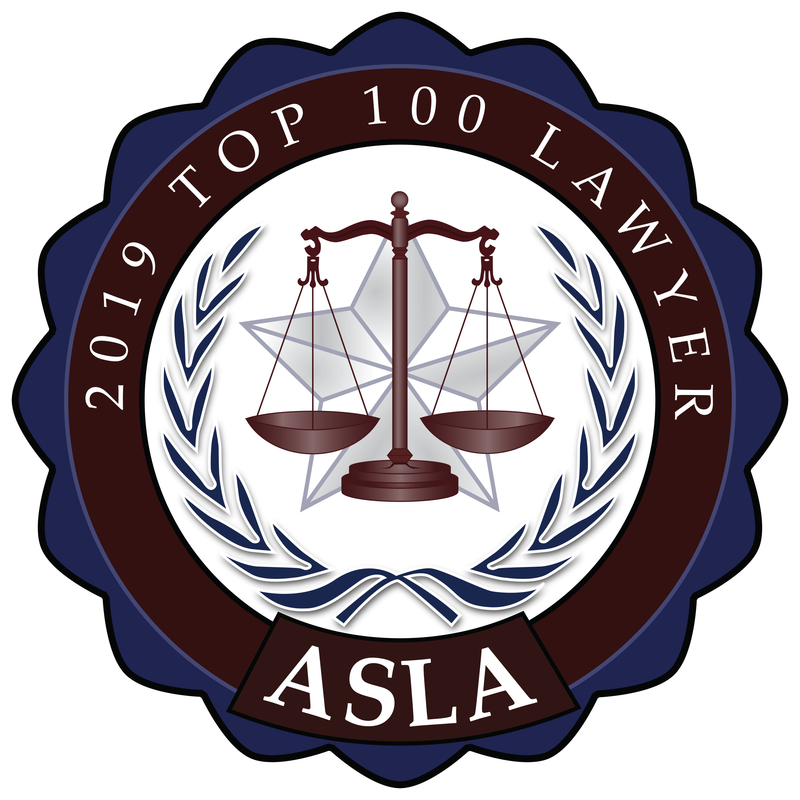 American Academy of Attorneys, “Top 100 Attorneys”. The purpose of the American Academy of Attorneys is to promote top-tier attorneys who exemplify the standards and professionalism one should expect from an attorney. A member of the Academy has shown they posses an impressive knowledge of the law and the highest ethical standards. The TOP 100 designation is reserved for the more seasoned attorneys. These attorneys have well established themselves as the best of the best. There are only 100 attorneys in each state that bear this designation. Medical Malpractice Lawyers Magazine 2012-2018, listed in “The Top 1% Trial Counsel for Medical Malpractice” in NY. The National Academy of Personal Injury Attorneys, “Top 10”. The National Academy of Personal Injury Attorneys is an organization devoted to recognizing the top Personal Injury attorneys in the nation. With over a million attorneys in the United States, choosing the best lawyer is achieved through a stringent selection process. 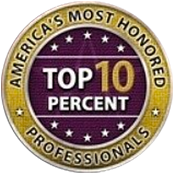 NAOPIA awards the best Personal Injury attorneys in each state with our most prestigious honor of being named “TOP 10”. The very few attorneys (less than 1%) that are good enough to make our list have demonstrated an extraordinary amount of knowledge, skill, experience, expertise and success in their practice of Personal Injury. The attorneys that make our list have to be one of 50 attorneys chosen to advance to the final selection stage by our processing committee, and then our Board of Governors officially selects the Top 10 in each state. American Institute of Personal Injury Attorneys, “10 Best for Client Satisfaction Award” 2015- 2018. 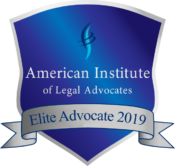 Attorneys who are recognized by the American Institute’s Personal Injury Division are considered the best in the industry for client satisfaction. The American Institute’s Personal Injury Division compiles an exclusive list of the “10 Best” Attorneys for each State. 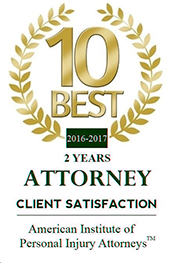 The “10 Best” is a prestigious honor for the Attorney as each Attorney must: Be formally nominated by the Institute, client, and/or fellow Attorney; Have attained the highest degree of professional achievement in his or her field of law; and Having done so with an impeccable Client Satisfaction rating. The American Institute’s Personal Injury Division looks for Attorneys that have achieved unparalleled success but most importantly have done so for the benefit of their client. ASLA brings together a select pool of diverse legal talent for the benefit of their members and the public. With membership limited to less than 1.5% of of all licensed lawyers nationwide, we select outstanding lawyers in all states, with specialties varying per state depending on the number of practicing lawyers. ASLA aims to serve as a go to source of exceptional legal advocacy, and, in turn, to strengthen professional relationships and best practices among member lawyers. The American Institute of Legal Advocates (AIOLA) is an organization committed to advocating attorneys with the highest legal standards in each state. AIOLA reviews select candidates who have positive reviews for outstanding work in their field, positive recommendations of other lawyers in their field, along with no ethical concerns from their local licensing authority. Less than 1% of all attorneys will be invited to be a member of AIOLA. "Peter DeFilippis is a great attorney, with an exceptional grasp of - and attention to - relevant details to help build his case. Peter is an aggressive, knowledgeable, and compassionate advocate for his clients, and I recommend him to anyone in need of legal representation." ~Erdal Turnacioglu, Esq., A former opposing attorney on a matter.